In the pocket of Western Europe that includes France, Belgium and Switzerland, endurance racing is a way of life. Small teams and factory-backed giants meet at some of the world’s most famous circuits, like Spa and Magny-Cours, to battle it out for up to 24 hours straight. One such event, the Bol d’Or, holds a special place in the hearts of Belgians where from as early as 1927 the small nation has tasted success. 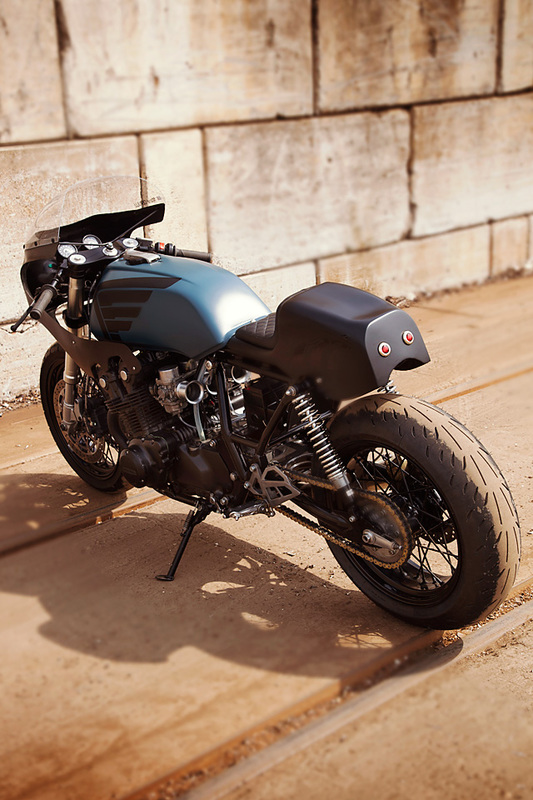 For Deep Creek Cycle Works from Diepenbeek, they don’t only build custom bikes but come the weekend they take their love of racing to the track where they compete in the European Classic Endurance Racing series. 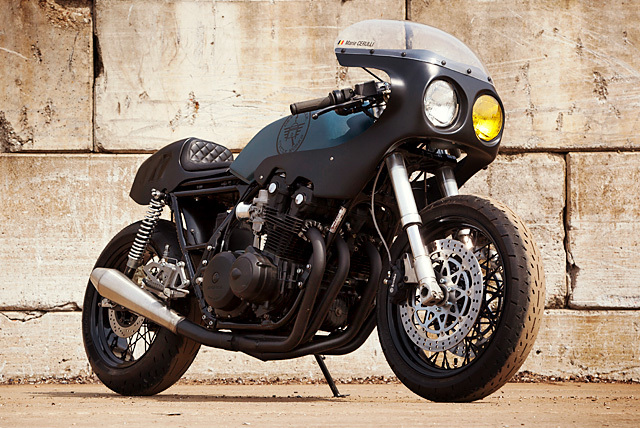 So when one of the race crew members was after a new ride for the street, it made perfect sense to build a 1981 Honda CB750 Bol d’Or road rocket, a bike they fittingly called the ‘Bol Noir’. 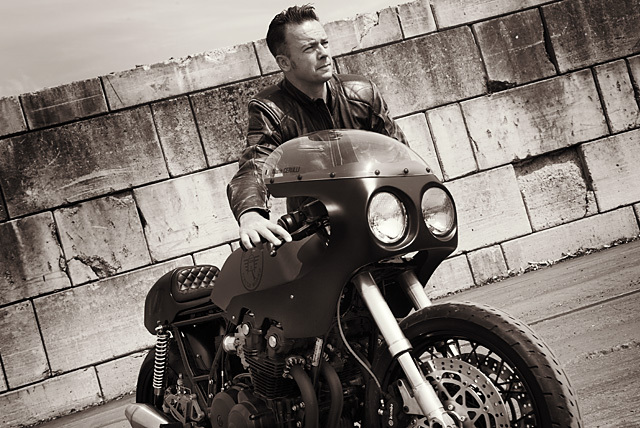 But as head honcho at DCCW Kris Reniers explains it didn’t actually begin so smoothly, “The donor bike for this build was a scrapper that we bought for 400Euros, we thought it was a 900cc engine but we bought it too quick, it was a 750cc which was no good for racing, therefore we rebuild it for the road, an endurance racer for road use if you will!” It can be an easy mistake to make when the distinguishing parts and panels have been removed but the CB750 is no chump and given their experience racing an 1100cc version, in the bike destroying endurance series, they knew they could build something special. But before they got to screwing together one of their bullet proof engine packages the scrapper would have to be brought up to spec from top to bottom. With the bike back to a bare frame and a neat pile of useable parts in the corner the chassis went up onto the lift. The front was an easy fit to the SS Ducati axle but the rear required considerable work to the Honda swingarm, firstly so that it would fit and then to ensure that the chain would run straight. This is a measure many don’t properly consider or solve when carrying out such a conversion and the strain on gearbox, sprockets and chain often results in extensive failures. With this taken care of and the right spacers machined the rear wheel went on a treat. But before they were finished the Ducati rear braking hardware was also swapped in with the Brembo drilled disc and caliper providing further stopping power. 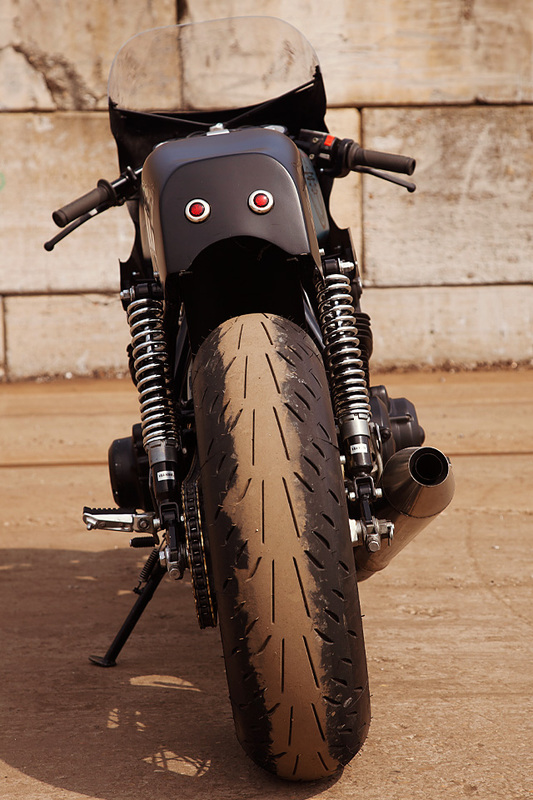 The new 17 inch spoked rims required a different direction in tyre choice than would normally be used on a CB750, first to consider was the aspect ratio to ensure a level stance and then with tape measure in hand making maximum use of the newly reworked swingarm. The result is a smaller diameter front tyre for faster steering while out the back a massive Michelin Power Supersport in a 180/60/17 gives a tough look and provides endless grip. 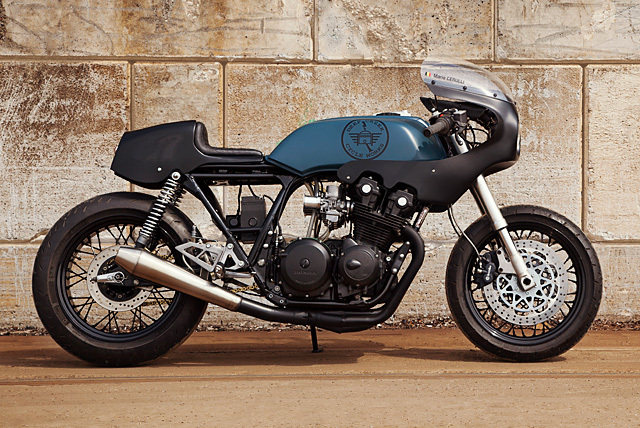 With such a serious rolling chassis that clearly has a race bike flavour the guys decided to give the CB a matching look and started with a MotoMartin front fairing that matches the item used on their race bike. Small modifications were made to the fairing to give it a custom touch, the front was opened up for headlights but it’s the clever cut outs for the unique Honda valve cover that separates it from so many other faired bikes we see today. 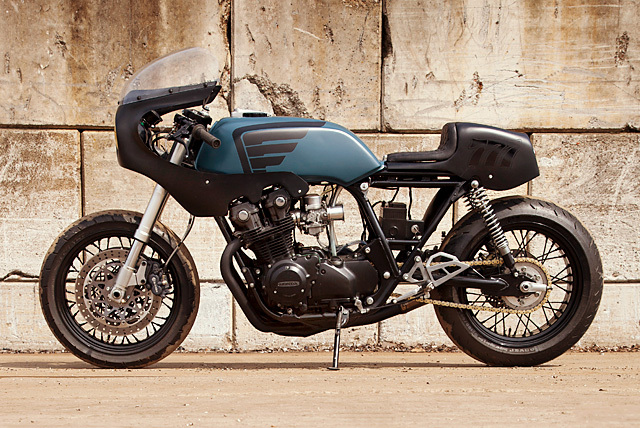 The classic CB750 styled tank of the DOHC models was body-worked till it was dead straight and then new mounts fabricated so the tank lines run parallel to the frame rather than the droopy factory look. The tail section is identical to the one that the DCCW team runs in racing and is the original shape used on the factory racing bikes from 35 years ago. 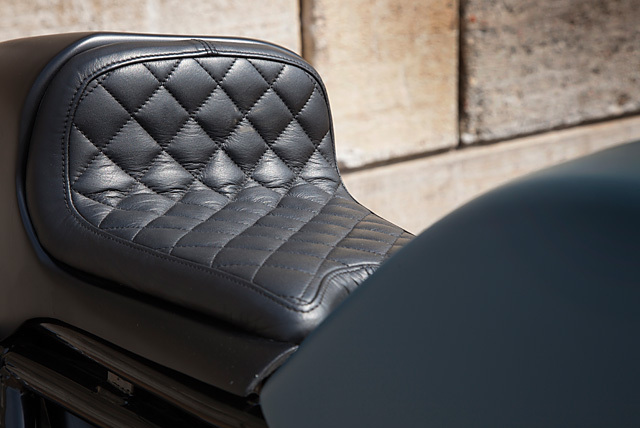 Although the addition of a comfortable diamond stitched black leather seat is not something used on their race bike Kris says with a smile; anyone who has watched Endurance racing will have witnessed the riders limp in pain as they climb off their steed after a stint in the saddle. As the bike was being built for a female member of the crew, they wanted the paint work to continue on with the tough nature of the rest of the build. “Knowing that the girl who rides this bike is the sweetest thing is always a laugh for her when she steps on the bike and people go like; look at her!” So to capture the feel the paint was deliberately laid down in a matte finish with a combination of black and subtle blue for the tank. The graphics are a clever use of Honda’s wings logo on the tank and their race number 777 on the tail-piece. But one of the dangers of starting a build with a cheap bike is almost always the electricals; old wires and components don’t respond well to time, let alone the outdoor elements and the entire loom was toast or as Kris puts it “a cat couldn’t find her kittens in the old electricals.” There is nothing “tough” about constant break downs, so to clean up the look of the build and ensure total reliability a new loom was built from scratch which also saves chasing nagging problems in the future. A high power, lightweight battery sits in a custom tray under the seat with the rest of the wiring and accessories routed along the back bone or hidden under the racey tail section. The engine might not be the 900cc monster they were hoping for but the 748cc twin cam still packs more than enough punch to keep things interesting. Running an enduro racing operation means DCCW know how to screw a reliable engine together and with a full rebuild and plenty of the tricks they’ve learned over the years there are some extra ponies to boot. 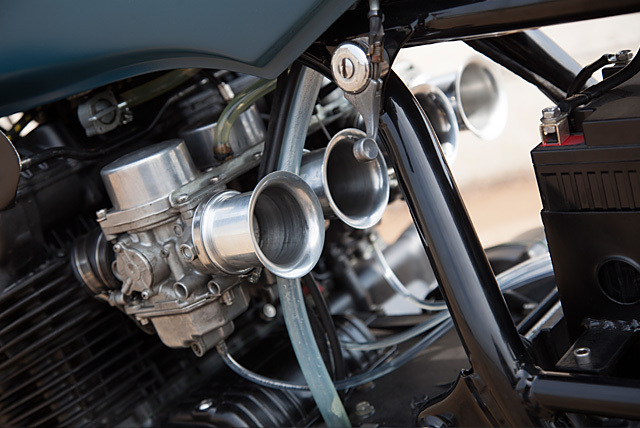 The bare engine has been given a lick of heat proof black paint for a tougher look and a 4 into 1 exhaust system adds even more power, reduces weight and sounds race ready with the reverse cone single muffler. With the stock Keihin carbs now breathing through open velocity stacks like a race bike more of their tuning know how was put to good use to get each chamber matched and balanced for smooth running. All new clear fuel hoses both from the tank and off the float bowls add to the racing look and the old school choke lever adds some extra cool. 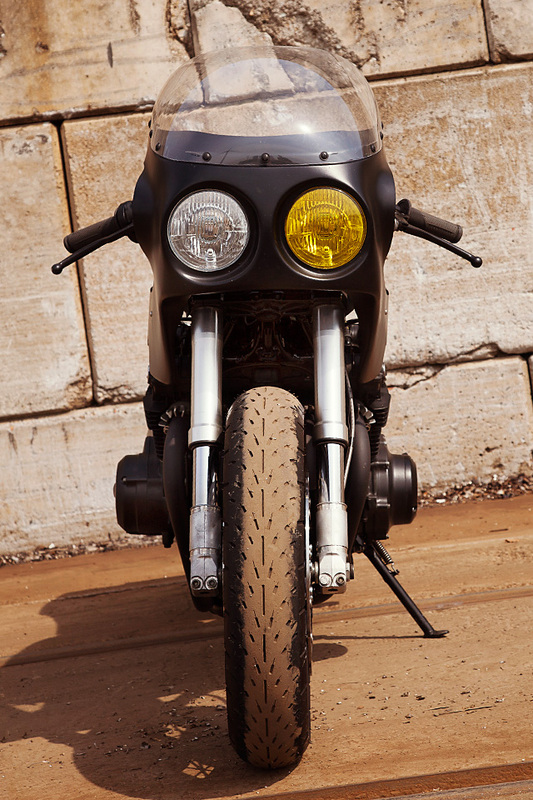 To give a different touch to the lighting setup the front end features the typical twin headlights of an endurance machine but with one clear and one yellow lens, she winks, while out back the minimalist racer theme calls for just two small LED tail lights and no indicators were deemed necessary. The completed build was never intended to be a perfect show bike but to ensure a crew member had a race like machine, indestructible in nature, to be thrash about on the road. “We like this small racer and our friend was blown off her feet when we drove it up her driveway on her birthday. Life can be sweet and the tears in her eyes are the greatest thanks we could get.” They ride together, they race together and when they’re not crafting classics for their customers the team at Deep Creek Cycle Works takes care of their own and who wouldn’t want to be a part of a crew like that!